"Compact cabins. Spacious meeting area, very comfortable. Party size of 18 felt about right. Food 5*. Service excellent from a friendly crew. We enjoyed the mix of water sports, walks and talks. " "Somewhat compact accommodation but we soon got used to it and settled in. The steward's attention to the canon was exemplary and all the crew were very hardworking and efficient. There was never a dull moment." "We loved Letty. We took the last available cabin (10) on the bottom deck (Iguana). I was worried this might be small and noisy but it actually turned out to be much more spacious than the cabins on the top deck. We had bunks and a single bed which meant we could use the top bunk for storage. it wasn't too noisy but again I'd recommend earplugs. All the staff and the two naturalists (Freddie & Pepe who were very knowledgeable and obviously loved their roles) were delightful and the food plentiful and delicious. The organised activities i.e. visiting islands, snorkelling, kayaking, which were optional, were just the right mix and there was plenty of time for r & r after lunch. We were always split into two groups (random) so never more than 10 with each naturalist. We understand both Eric and Letty are going to be replaced either at the end of this year or next. A word of warning - no credit card facilities for paying the bar bill.Reply from Tribes: There are currently no plans to replace the Letty. 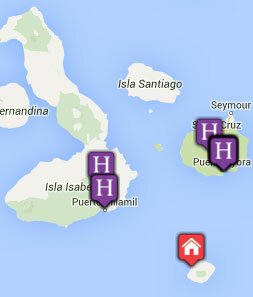 The vessel does have credit card facilities however internet services in the Galapagos are unreliable. It was unfortunate that the internet was inoperative at the time it was needed." "Altogether EXCELLENT, a thoroughly enjoyable week. One small aspect that you could endeavour to get your ducks in a row with the boat and tour company is the tipping recommendations. Your recommendation, the boat's recommendation and our travel book's recommendation all suggested widely differing levels of tipping. Suffice it to say that these days carrying large amounts of cash through to the end of the holiday is, I believe, a thing of the past. It won't be too long before cash, in particular high denomination notes disappear, in my view." "The Eric was kept immaculately clean. Always had hot water and plenty of it for showers, etc. We loved the sundeck and communal sitting area which were both very sociable. The food was great and we were very impressed with all the snacks ready for our return from outings." "more cramped than expected . nowhere to dry clothes. would be nice to have walking sticks that fold open to make a seat as the trails were somewhat arduous with nowhere to rest. Crew were excellent. Yvonne and Fabrizio were excellent if a little long winded." "The accommodation on board the 'Letty' was comfortable and clean, serviced several times a day by the very efficient staff. The food was delicious and plentiful, with snacks in between ample meals! There was complementary wine with the evening meal. The staff, from the Captain down, were friendly, helpful and great fun! We particularly appreciated the chocolate samples left on our pillows each evening!" "Excellent but showing age and needs up dating. Service staff and good all excellent "
"Everything was to a high standard; the food was excellent and the daily briefings very comprehensive." "Eric was great! Captain & crew couldn't have been more welcoming & the food amazing given the limitations of a galley on a boat! Galapagos lived up to expectations. " "The food was first rate, especially when you think about the small space they had to prepare it. I particularly liked the snacks that we were offered after each activity, plus the delicious fruit juices. The cabin was bijou so I would advise people to cut down on what they take. You really do live in shorts and T shirts." "Actually the Flamingo, on its last trip. Chose the wrong room - on the Booby deck - over the engine and cramped on one side of the bed under the angled roof. First class meals (too much food!) and service, excellent crew, very pleasant and helpful." "Letty, fabulous! Also food very very good. Everyone could not have been nicer or more helpful. Claudia, the steward was amazing! As we paid extra for cabin on Letty, was a little disappointed with it. We expected small and cosy and it was. Bed though was small and pushed in under slanted ceiling. This reduced bed size and meant waking each other if we wanted to get up!" "Our cabin on Ericâ€™s Dolphin deck was compact, but with adequate storage, a well-fitted bathroom, a roomy shower and windows all along one wall. Unlike some of our fellow guests we were not disturbed by noise from the engines, the anchor or the kitchens and, though the air-conditioning was not adjustable, our cabin temperature was not uncomfortable. Public areas on the boat were tailored to the 20 guests without much space to spare except on the sundeck, a partly-shaded area with plenty of loungers and seats. The captain and the crew were friendly, helpful and professional, the daily activities were well-organised, the food was excellent and the itinerary was planned so that we were able to see something new on every excursion "
"Everything was excellent - cannot fault anything." "As I am sure you will guess this was absolutely superb! The boat (flamingo) was just the right size. Food, crew and guides were all very good. Wildlife exceptional." "We were upgraded to 2 cabins on Dolphin deck of Eric which meant we had great views and fresh air. There were only 14 passengers which gave us very small groups with our 2 guides Ivan and Karina. These guides were outstanding, full of enthusiasm, very knowledgeable and contributed immensely to a wonderfully fun atmosphere. The chefs produced delicious food and we were greeted with a different snack by Hugo after every activity when we came back on board. The Captain showed us the Bridge after dinner as we crossed the Equator and we saw the GPS at 0,00.000. The cabins were so well looked after with plenty of towels made into different animal shapes each day." "Food and staff on yacht were excellent. We were able to borrow snorkelling gear rather than have to hire it. We did have a very noisy cabin near to engine room and kitchen which made it difficult to sleep when sailing. We did think the level of tip they suggested was excessive due to the average local wage." "It was great and fit for purpose. The cabins are necessarily small but comfortable. The sun deck could do with more furniture. I had not realised that I had booked the 'worst' cabins (Iguana Deck) with virtually not view out and bunks rather than beds."